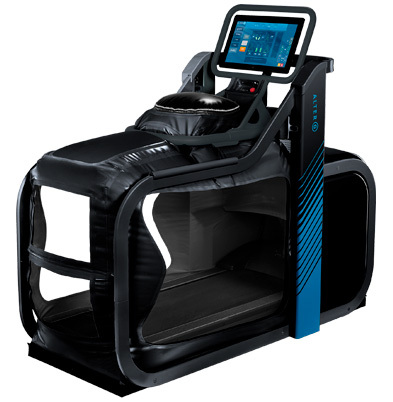 AlterG® Anti-Gravity Treadmill™ technology combines precision unweighting technology with real-time gait analytics and video feedback for advanced body weight supported therapy and training. New hope for increased mobility, new ways to reach higher. The AlterG® Anti-Gravity Treadmill™ integrates patented, NASA Differential Air Pressure (DAP) technology, a precise air calibration system, and real-time information to change what’s possible in rehab and training. Using a pressurized air chamber to uniformly reduce gravitational load and body weight in precise 1% increments, AlterG enables patients and athletes to move unrestricted and pain-free – restoring and building muscle strength, range of motion, balance, function, and fitness. No other unweighting technology offers as much freedom, control, and versatility. Using air to unweight patients and athletes enables an unprecedented level of comfort and mobility – without impeding natural gait mechanics. NASA-based technology applies positive air pressure to gently unweight users in 1% increments to as low as 20% of their body weight – quickly, effortlessly, and precisely. Users calibrate their effective body weight based on their comfort level to achieve pain-free movement or to allow for partial weight bearing exercise as tolerated. Real-time gait analytics and live video feedback allow users to understand their movement patterns and make corrections on the fly for faster, better outcomes. The positive air pressure chamber and fall-safe environment enable the controlled progression of weight-bearing activity and training volume – without impact on joints or risk of injury. Unlike harness systems and hydrotherapy, AlterG’s technology can be effective for patients across a broad spectrum of diagnoses and therapeutic stage. In the AlterG system, users gently “unweight” themselves with positive air pressure to reduce gravitational forces on the body. All so they can move like never before to regain, maintain, and improve mobility, wellness, and performance. The all-new Anti-Gravity Treadmill offering AlterG’s hallmark Differential Air Pressure (DAP) technology and precision unweighting system. 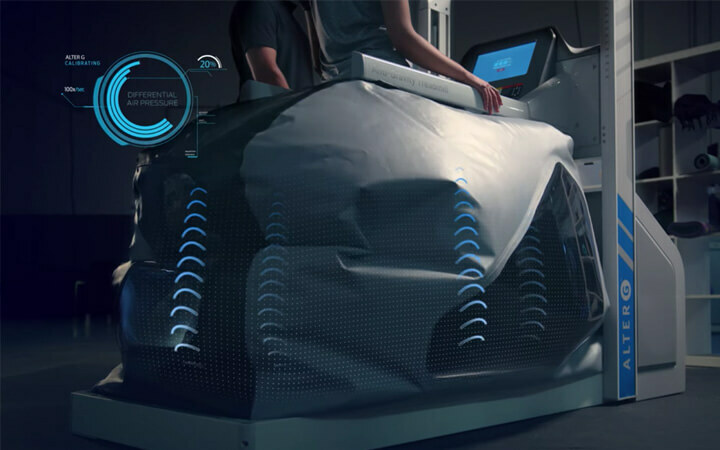 Richly featured Anti-Gravity Treadmill integrates gait analytics, data reporting, and live video monitoring with DAP for physical therapy, rehabilitation, and sports performance applications. High-performance, robustly engineered Anti-Gravity Treadmill technology with top-of-the-line Woodway® treadmill, integrated gait information, data reporting, and video monitoring for elite athletes.